For MacGregor/Venture owners in Australia and discussions about country-specific sailing-related topics. After looking and dreaming of a Macgregor since 2013 (we looked at a new one at the importers shop on the Gold Coast, but bought a Cuddy Cabin speed boat instead due to available funds at the time), we have finally decided to sell our current speed boat and upgrade to a Macgregor. Still on the fence with a or , it will depend on what comes along in good condition and at the right price - both models seem excellent. We live in Brisbane and I was hoping a local Macgregor owner would be going sailing one weekend soon and wouldn’t mind an extra crew member for the day? I’m keen to get on the water in one and to lean more about them for when we are looking. Also open to any suggestions on Mac’s that might be up for sale soon. We look forward to joining the Australian Mac community. I wish I had read this last week, I had my in the water from the 21st to the 28th, would happily have taken you for a spin, sorry about that but I don't plan on any more trips for a couple of months. Happy to help in any other way though, just let me know. Cheers, Dennis. Ditto for my recent trip into Dennis territory, trap. 1. Trailer - rust on critical joints - mine looked ok but collapsed on Airlie beach ramp, where the frame joins main drawbar at front, rust was hidden inside the join.$5500 to 9000.if a new one is required.because the trailerATM is ovEr 1tonne you must get a safety certificate to register in Qld. 2. Outboard - service history is king, $7000 to 9000 for a new 60HP 2 stroke or 4 stroke if needed. Check it at least idles smoothly, changes years without grinding and pumps water, a simple compression test is easy to do and great piece of mind, Color of oil, unscrew gearbox plug or filler to get a look for any water or emulsified oil pointing to leaks. 4. Feul tanks and hose - replace with 4 X 22 l hulk from withworth anywayY so it's super easy to fill up, about $70 each. Also be aware the M has 2 layouts, my 2003 has the galley fixed up against the hEad wall, perpendicular to the keel, whereas most M have a slidinG GalleY I admire as you can push it to back and have full standing cooking. Each has advantages. I wouldn't be concerned about having an X or an M - I can only tell difference from the 2 black stripes on the M.
Modifications are crazy and endless- i just put in a fridge and 180w solar panel, checkout sailboatmikes posts - I'm going to do his autopilot project next (also check his posts into the trailer sailor forum website they are awesome, our boats get a lot of derision as caravans with a mast and big outboard from armchair fleet admiral keyboard warriors, but there's 10 times more of ours built than other models and that says it all - he gives it to them and it's hilarious, one day they'll just ban him and I'll lose thaT entertainment. I'm keen to do 1770 to lady MusGrave in July school holidaYs if anyone is interested, and weather window is available. That info is gold, I have saved it to my phone, Thanks. I hadn’t realised there was the 2 different galley styles in the until last week when I saw one for sale in Sydney with the fixed layout (casting the net wide for the right one). As you say, both have their advantages/disadvantages. I look forward to catching up with the Brisbane and surrounds Mac owners one day. 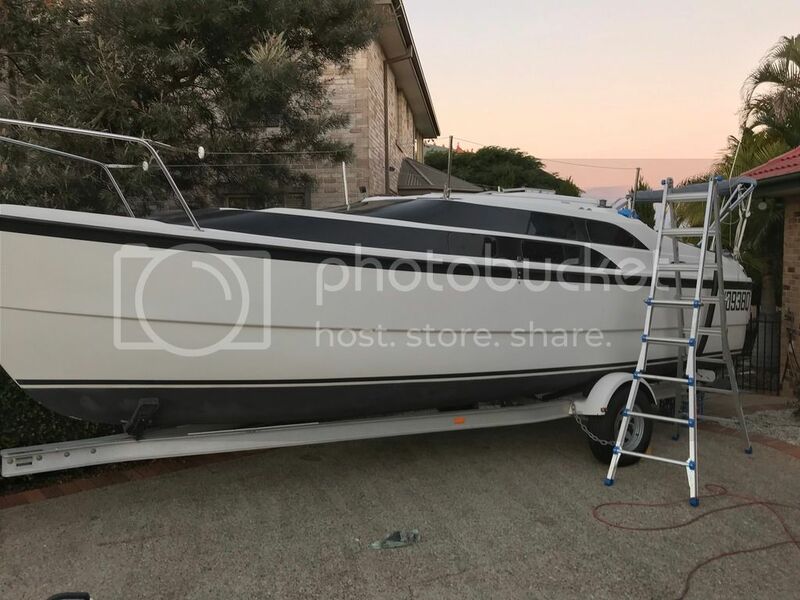 Hey Chris, good news, I am putting my boat back in the water (Mooloolaba) for 4 days from the 14th to 17th of June, 2 weeks away, if you are still keen on a sail then let me know, I am sure we can arrange a suitable time, maybe on Saturday if you work? I work but have the Thursday off and Friday is a local show holiday here. Just reply here if you are interested. That would be great. Saturday or Sunday would be awesome. I’m looking at a couple of Mac’s at the moment so may even have one soon, but I’m still keen to come for a sail and “learn the ropes” so to speak. I will PM you my mobile number etc. No worries Chris, Probably Sunday would be best but I do intend to pull the boat out of the water by 1pm at the latest so it would need to be no later than a 9am start to give us a few hours good sailing weather permitting. Let me know, cheers. Den. We are now the proud new owners of a . Time for the elbow grease getting some maintenance done and then onto the water for some shakedown sails soon. Soon to be named, will let you know what’s she is called after that. When I work out how to post photos I will post one up. Pictures are required of course! Well done on the purchase. I’ve been doing quite a few jobs to her and I will post some of the end results up soon. Hey Chris, she's a clean looking boat, I look forward to seeing her up this way soon. So clean!! Looks brand new - congrats! Welcome aboard the Macgregor owners club, believe me people (aka real sailors as they call themselves) will try and put down you Mac, BUT we all love our Macs and they ALWAYS get admiring looks at the ramp or driving down the road I think the "real sailors" are just jealous. On a final note of welcome, also welcome to being POOR, buying a sail boat is the best way to make a rich man poor and a poor man poorer.